Scolarly article “Selective Photoantisepsis”, is another educated guess as to why we get such nice results with LANAP Laser Surgery protocol. Here’s an article that again shows that lasers can be uniquely helpful in treating periodontal [i.e. gum infections]. If you don’t want to ready the details [which are incredibly fascinating], scroll down to the red highlighted summary for the results. That, however, is almost cheating. In a study published in the journal Lasers in Surgery and Medicine, the researchers show the results of simulations depicting various laser wavelengths aimed at virtual bacterial colonies buried in gum tissue. In humans, actual bacterial colonies can cause gingivitis, or gum inflammation. Gingivitis can develop into periodontal disease, which involves a more serious infection that breaks down the bones and tissues that support teeth. “The paper verifies or validates the use of lasers to kill bacteria and contribute to better health following periodontal treatments,” said co-author Lou Reinisch, Ph.D., associate provost for academic affairs at New York Institute of Technology. Drawing on his background in physics, optics, and calculus, Reinisch, an expert in laser surgery and an associate editor with the journal, created mathematical models based on optical characteristics of gum tissues and bacteria. He then produced simulations of three different types of lasers commonly used in dentistry and their effects on two types of bacterial colonies of various sizes and depths within the gum models. “One of the questions we asked is how deep could the bacteria be and still be affected by the laser light,” said Reinisch. The simulations indicate that 810 nm diode lasers, when set to short pulses and moderate energy levels, can kill bacteria buried 3 mm deep in the soft tissue of the gums. The 1064 nm Nd:YAG laser is also effective with similar penetration depth. Both lasers spare the healthy tissue with the simulations showing minimal heating of the surrounding tissue. Minimizing the thermal damage leads to faster healing, says Reinisch. The cost of dental lasers can range from $5,000 to over $100,000, according to Reinisch, and health care professionals require extra training to use them. These costs are passed on to the patient so Reinisch notes there must be a definite benefit for the patient to justify these costs. 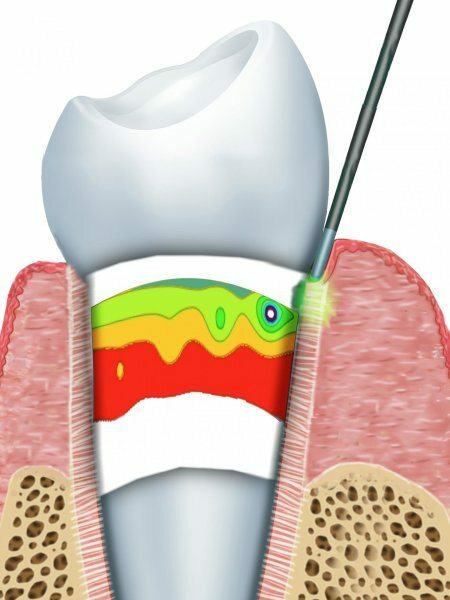 Harris noted that the Academy of Laser Dentistry estimates that at least 25% of US dental offices have dental laser capability for periodontal treatment as outlined in the paper, along with a host of other soft tissue surgical procedures and hard tissue procedures like removal of dental decay. Harris said the video simulations demonstrate what happens when lasers hit buried bacterial colonies. In a first for the journal, the published results include video depictions of the computer simulations. The journal readers can actually see the soft tissue of the virtual gums and bacteria heat up and cool down as the simulated laser is scanned over the tissue. The study’s methodology of simulating how laser light interacts with tissue has implications beyond dentistry; physicians and surgeons use lasers in various treatments, including vocal cord procedures and dermatological treatments, including those for toenail fungus. Guided by the results presented in this study, both Reinisch and Harris expect that clinical trials will be designed to validate the findings. The study, entitled “Selective Photoantisepsis,” is published in the October issue of Lasers in Surgery and Medicine. Materials provided by New York Institute of Technology. Note: Content may be edited for style and length.